As the world’s leading trade fair, Interpack is the major inspiration for the packaging industry and all related process technologies. 2,700 exhibitors from more than 60 countries will present their latest ideas, innovate concepts and technological visions at interpack – not only in equipment and machinery for packaging and processing, but also in production tools for packaging materials, materials themselves, and services for the entire industry. You will find Kelva at Lundberg Tech, Hall 12 / B48. We will inform you about our specific web cleaning and waste trim solutions for the packaging industry. 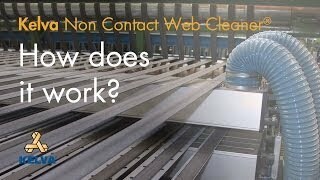 Kelva Non Contact Web Cleaner removes dust from moving webs, safeguarding a constant quality of your production - without downtime or damage to your product.